new year | Namaste. . .
Well, but not this year. . . . Here is a link to find out more about Losar. But this year, instead of celebrating a new year, a new beginning, we stand together to mourn for all those who have taken their lives in protest of the Chinese Occupation of Tibet and for all of those who have been killed, tortured, and have fled from their homeland. During the past year, we have witnessed countless reports of young people who have died by self-immolation and more uprisings in the tortured country of Tibet. Here is a Q&A from His Holiness that I found on the net asking about how we deal with those groups who have committed unspeakable acts. . .
“How does a person or group of people compassionately and yet straightforwardly confront another person or group of people who have committed crimes of genocide against them? Let us hope that it is with this New Year that we find continued hope and renewed action in saving the Tibetan people and their hertiage. Maybe this will be the year that the world leaders say, enough, we won’t stand by and watch innocent people die. Maybe this will be the year that we help others selflessly rather than for what they or their country have that we can benefit from. Perhaps this will be the year when the individual will matter more than the state and we will embrace our interbeing with all sentient beings and learn to live compassionately and congruently. I have two favorite times of retreat…Reciting the Five Contemplations before eating and washing dishes. Now, I have to say, I hate washing dishes at home every night. Probably because at home, there is always something to do, something to keep from doing, or something to run to and from. It also doesn’t help that no more than one person can actually be in my kitchen at any given time. I get annoyed with the shallow sink that eventually has water spilling over it and on to the floor. And yet, with all that water, my floors need to be constantly mopped… Washing dishes at home is more of an annoyance than any great spiritual endeavor, but it’s because of the attitude I approach it with, not the chore itself. When I’m on retreat, there is nowhere else to go, no one else I have to be, nothing else to think about except the smell of the bleach water and the tingling of my hands. It seems like such a free time, like no other part of life. I don’t always like sitting on the cushion but I do like mindful activities. Any activity can be done mindfully. Showering, walking, writing, taking photos of the wild life, eating an orange, drying the dishes. And you really don’t need to be on retreat. Retreat for me means giving myself permission to do all of those things slowly, quietly, with specific attention. But I said that there were two favorite times for me… the other that I enjoy so much is reciting the Five Contemplations. I think I enjoy this activity so much while on retreat is because it becomes a communal prayer when we are together in the dining room much like saying grace before dinner was a few moments of oneness before I ate dinner with my parents while I was growing up. “This food is the gift of the whole universe: the earth, the sky, and much hard work. The Five Contemplations remind me of Thay’s (Thich Nhat Hanh) explanation of no self and interconnection. He says something like this: the bread that I hold in my hand, I see that it is not bread. I see in this piece of bread the whole universe. I see the sun, water, and soil which allowed the grains to grow. I see the farmer who tilled the land to harvest the wheat. I see the driver that brings the grains to where they will make and bake the bread… etc. etc. etc. There is something about reciting the Five Contemplations that helps me to remember all that has come before me and all that will come after I am dead. It situates me in the cosmos, in the sangha, in the dining hall, and in the moment as I say the words and take my first bite. I love the idea of mindfulness making me “worthy” to receive the nourishment. Worthiness isn’t a judgment, it’s a readiness. Taking a few moments before eating my meal to honor everything that has gone in to bringing me that meal and to honor all that has gone into making me. I love the idea of remembering that food is nourishing and its purpose is to keep me healthy and to keep me sustained. I wonder what it would be like for more of us to think that before we pick up the fork. Would we waste as much food? Would we eat as much food? Would we stand for eating as much food as we do that is unhealthy for us? Would we remember this the next time we grocery shop, the next time we prepare a meal, the next time we vote for politicians who back subsidies? One goal I have for the next year it so pick something, during my average everyday life like a chore around the house and do it mindfully rather than waiting to be mindful on the cushion or while holding a mala. And I want to do this daily. Maybe today it’s brushing my teeth. Maybe tomorrow it is sending a note to my aging grandmother. Perhaps it’s picking out vegetables at the local store. Perhaps it will be when I walk between buildings on the campus at work? This year, I don’t want to wait for retreat time and the smell of the bleach water. 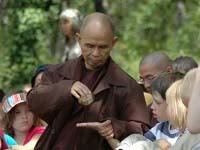 I don’t want to wait until I find a new sangha. I want to care for myself, my world, and the whole universe. I want to take the time to be grateful for all of the things and people that have created my world – my ancestors, my family of friends, those who have died, those whom have stood by me during the darkest of hours. This year, I want to give myself the gift of mindfulness off the cushion every day. This year, I want to have enough compassion and love for myself to water the seeds of compassion in my world.